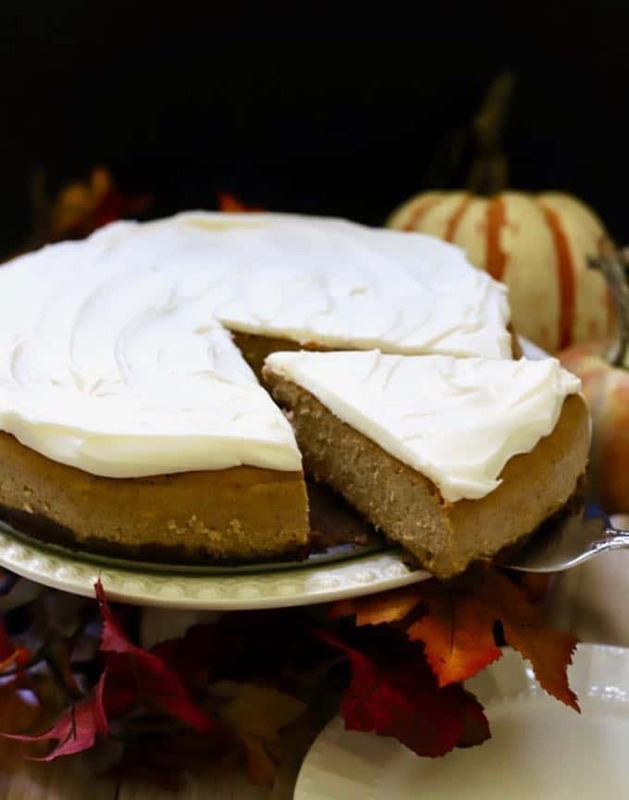 Move over pumpkin and pecan pie, this amazing Pumpkin Cheesecake with a Gingersnap Crust is sure to become your new favorite holiday dessert! 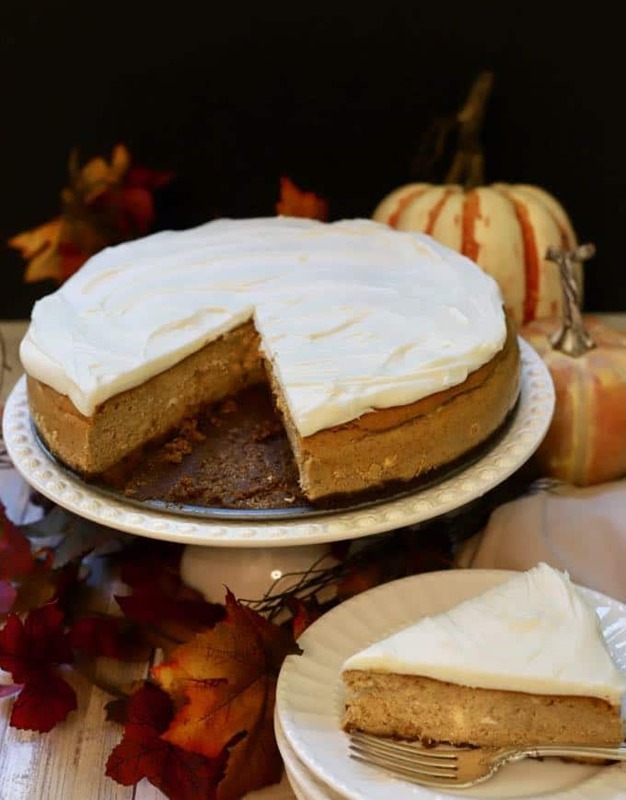 With a crunchy homemade gingersnap and pecan crust, a layer of rich, creamy pumpkin cheesecake with warm spices, and a layer of thick, silky, cream cheese icing, this decadent Pumpkin Cheesecake with Gingersnap Crust is the ultimate sweet ending to your Thanksgiving or Christmas dinner! My niece Susan Ensley is renowned in our family for her cheesecakes. And every holiday we all look forward to her latest creation. 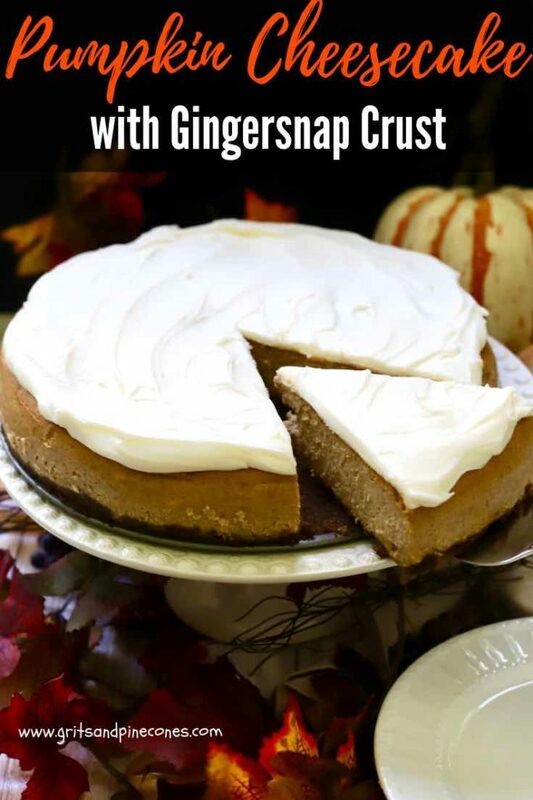 But one of her signature and most requested recipes, that is always a huge hit at Thanksgiving, is her Pumpkin Cheesecake with Gingersnap Crust. Thank you, Susan, for sharing your wonderful recipe with us! This delicious cheesecake has a few more steps and takes a little more time than most of my recipes, but I can assure you the results are spectacular. Just don’t wait until the last minute to make it; give yourself plenty of time. If you like cheesecake, you might also be interested in these other popular holiday cheesecake recipes: Apple Pie Cheesecake with Caramel Topping, Southern Pecan Praline Cheesecake, and Easy No Bake Cranberry Cheesecake. Preheat oven to 350º F. Position the rack in the center of the oven. Wrap a double layer of heavy-duty foil around the outside of a 10-inch springform pan, all the way to the top. 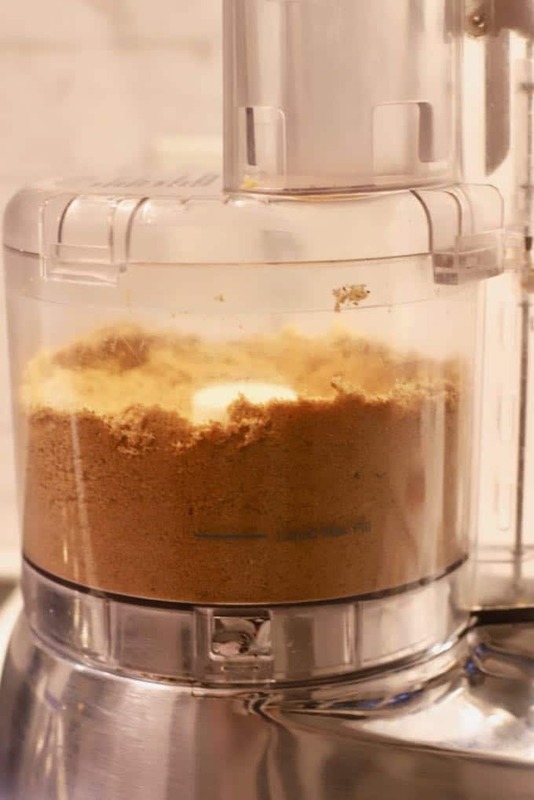 Combine cookies, pecans and brown sugar in a food processor. Blend until mixture is fine and uniform. Drizzle butter over mixture. Using the pulse setting, blend until crumbs begin to stick together. Press crumbs onto the bottom, only, of prepared pan. Bake 10 minutes, until crust is slightly golden. Transfer to wire rack and cool while preparing the filling. Maintain 350° F oven temperature. 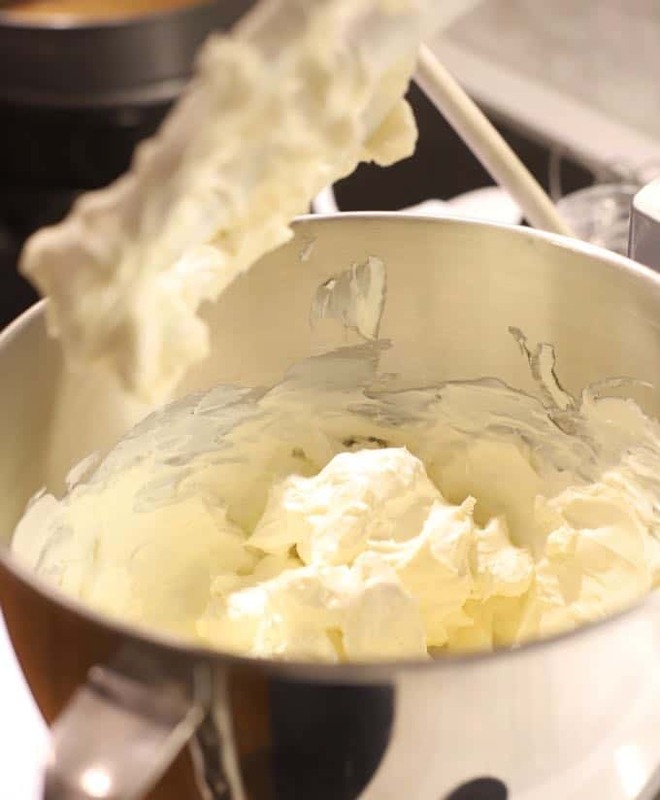 Using an electric mixer, beat 2 pounds cream cheese until smooth. Add sugar; beat until smooth and fluffy. Beat in eggs one at a time, just until blended; do not overbeat. Add pumpkin, whipping cream and vanilla; beat just until blended. Combine remaining six filling ingredients in a small bowl; beat into mixture just until blended. Pour into prepared crust. Place into a large roasting pan and add enough water to come halfway up sides of springform pan (a water bath). Bake cheesecake until slightly puffed, softly set and the top is golden; about 1½ hours. Turn oven off. Do not open door; leave cheesecake in oven for an additional ½ hour. Transfer springform pan to wire rack and cool to room temperature; remove foil. Cover and refrigerate cheesecake overnight. Leave in pan until ready to add topping and serve. 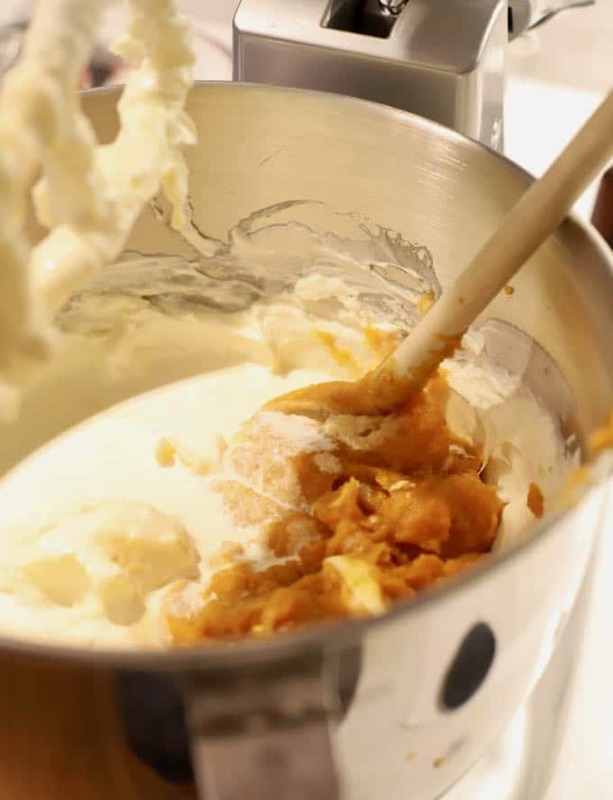 In a medium bowl, combine butter, cream cheese, confectioners’ sugar, and vanilla. Beat until the mixture is smooth and creamy. Run a hot knife around the inside of the springform pan; remove the side. Spread topping on cheesecake. Be sure to use pure canned pumpkin, not pumpkin pie filling. Do not overbeat the filling. Overbeating will incorporate too much air in the filling, which will cause it to rise when baking and then fall flat or crack. Speaking of cracking, cooking the cheesecake in a water bath also helps avoid cracking. However, if your cheesecake does crack, no worries! The cream cheese icing goes on top, and no one will ever see the cracks. Good news, leftover cheesecake freezes beautifully. 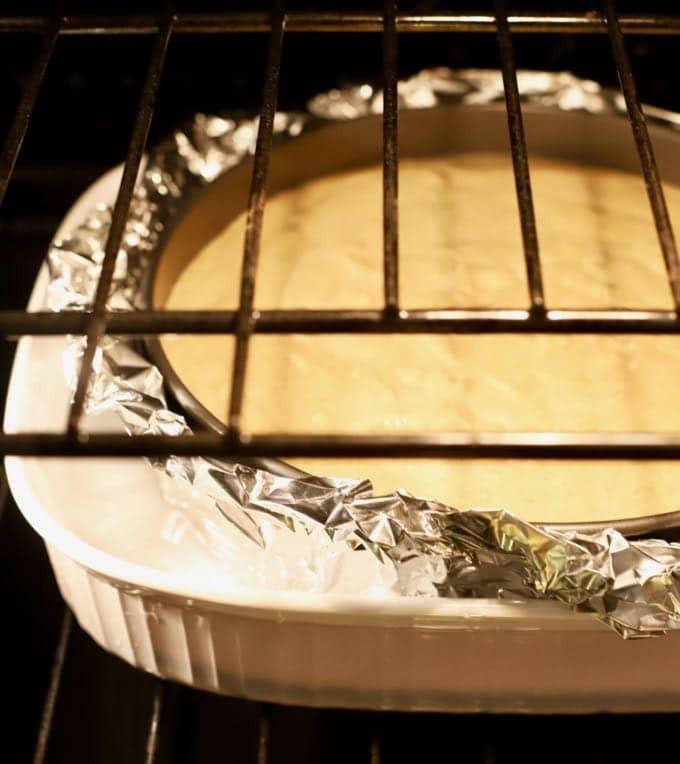 Simply place the cooled cheesecake on a baking pan and freeze, uncovered, until firm. Remove the cheesecake from the freezer, wrap it in heavy duty aluminum foil and place in an airtight plastic freezer bag. Seal and return to freezer. It can be frozen for several months. Let thaw overnight in the refrigerator. Use heavy duty aluminum foil to wrap your springform pan. This serves two purposes: one, it will keep the filling from leaking out in your oven, and two, it will keep any water from your water bath from leaking into your cheesecake. Baking your cheesecake in a water bath is important, it keeps the outer edge of your cheesecake from baking too fast, which can cause it to puff up, sink, and crack. Let the cream cheese, eggs, and butter sit on your counter at room temperature for 30 minutes to soften the cream cheese and butter, and warm the eggs, which will help them combine more easily. In a pinch, you can use a regular 10-inch cake pan instead of a springform pan. However, you will need to leave the cheesecake in the pan and slice and serve it from the pan. Press crumbs onto the bottom, only, of prepared pan. Bake 10 minutes, until crust is slightly golden. Transfer to wire rack and cool while preparing the filling. Maintain 350° F oven temperature. 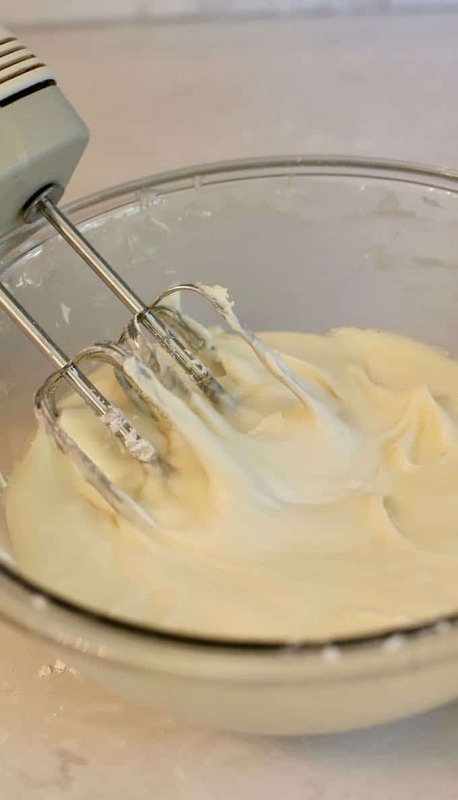 Using an electric mixer, beat 2 pounds cream cheese until smooth. Add sugar; beat until smooth and fluffy. Beat in eggs one at a time, just until blended; do not overbeat. Add pumpkin, whipping cream and vanilla; beat just until blended. Pour into prepared crust. Place the cheesecake into a large roasting pan and add enough water to come halfway up sides of springform pan (a water bath). Bake cheesecake until slightly puffed, softly set and the top is golden; about 1-1/2 hours. Turn oven off. Do not open door; leave cheesecake in oven for an additional 1/2 hour. 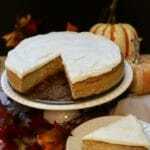 In a medium bowl, combine butter, cream cheese, confectioners' sugar, and vanilla. Beat until the mixture is smooth and creamy. Good news, leftover cheesecake freezes beautifully. Simply place the cooled cheesecake on a baking pan and freeze, uncovered, until firm. Remove the cheesecake from the freezer, wrap it in heavy duty aluminum foil and place in an airtight plastic freezer bag. Seal and return to freezer. It can be frozen for several months. To serve, let thaw overnight in the refrigerator. Let the cream cheese, eggs, and butter sit on your counter at room temperature for 30 minutes to soften them, which will help them combine more easily. 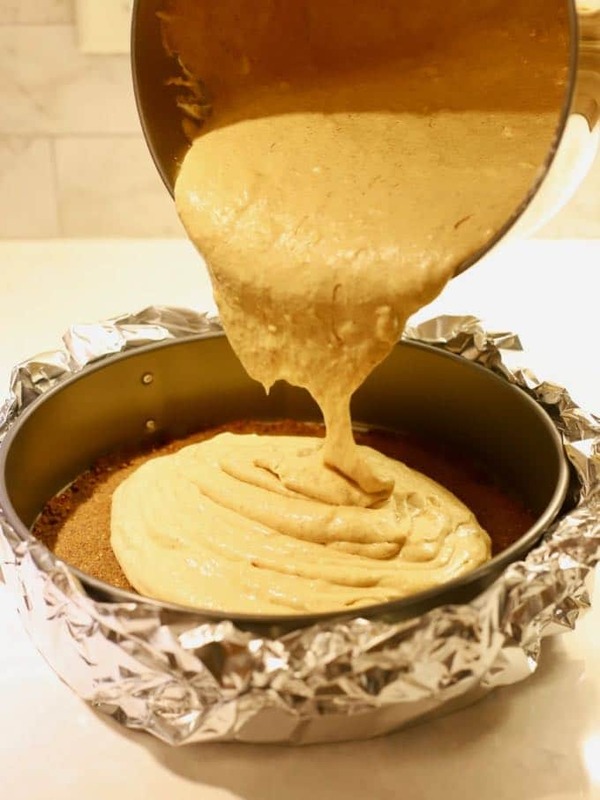 In a pinch, you can use a regular 10-inch cake pan instead of a springform pan but you will not be able to take the cheesecake out of the pan and will have to serve it from the pan.